There are at least two reasons to consider adding international exposure to your portfolio: diversification and global growth. International returns can also move in a different direction than U.S. stock market returns. Investing internationally could help guard against some of the risks associated with a solely U.S.-based portfolio. With a portfolio that includes domestic and foreign stocks, you could potentially reduce the risk of losses if U.S. markets decline. Investing internationally also lets you capture investment opportunities that arise from fast-growing economies and markets whose currencies are appreciating against the dollar. However, that goes both ways and the dollar has had a great run over the last year. Just like the adage about not putting all of your eggs in one basket, investing overseas may spread your portfolio’s risk out over several regions and dozens of countries. By diversifying internationally, you are not stuck with one type of security in a single region or subject to the performance of one asset class. Decades ago, the leading economies were found mainly in the United States and Western Europe, but things began to change as manufacturing moved to Asia and Latin America. The thriving economies of Asia, such as South Korea and Singapore, began gaining the attention of American investors. Then in 2001, an analyst coined the acronym BRIC when discussing then-emerging markets of Brazil, Russia, India, and China. These economies have seen rapid growth in the last decade, although recently they have shown signs of slowing down, everything moves in a cycle. Other up-and-coming markets that have recently begun to receive more attention include Mexico, Indonesia, Turkey, Hong Kong, and the United Arab Emirates which can be accessed through Frontier Market investments. International markets can offer growth opportunities that may not be available in the United States due to differences in household income, younger populations, availability of natural resources, export strength, and movement toward free-market economic policies. Many Asian countries, for example, benefit from exports to the rapidly expanding Chinese economy. Exposure to these unique growth areas, as well as emerging markets, can boost return potential. Emerging market countries typically have lower household incomes and lower debt levels relative to developed markets, giving them the ability to grow faster. Economic growth in the United States is expected to be subdued in the near term. As an example, the International Monetary Fund (IMF) is forecasting growth in the United States to be below world growth over the next several years. 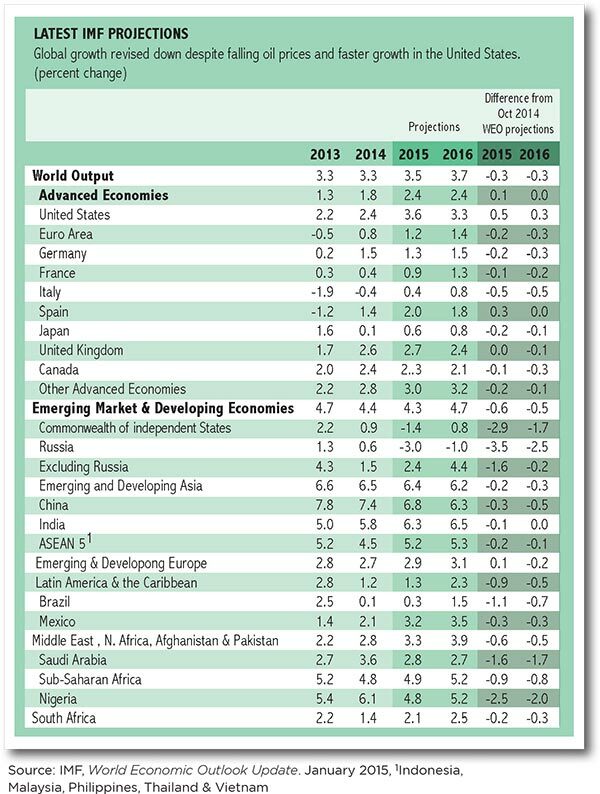 Emerging-market economies in particular are expected to have high growth rates which the IMF estimates are two to three times faster than developed-market economies. Corporate revenues have the potential to grow faster when economic growth is higher. However, bottom-line profits depend on how expenses grow. For example; wages in China have continued to rise this year, despite the slowdown in revenue growth. While some economists disagree on the criteria that defines a nation as “developed,”¬ most agree that the term applies to countries that have highly developed capital markets with ample liquidity, serious regulatory agencies, large market capitalization, and high levels of per-capita income. You can find developed markets in the U.S., Canada, Germany, the United Kingdom, Australia, New Zealand, and Japan. An emerging market can be defined as a country undergoing rapid growth that has lower personal incomes and may have a new or yet-to-be established market structure and infrastructure. Some emerging markets include Colombia, Egypt, South Africa, Turkey, and Vietnam. The term also can include what analysts call Frontier Markets, which are nations that are slowly adapting to modern capitalism such as Bangladesh, Botswana, and Nigeria. At WT Wealth Management we advocate an allocation to both developed and emerging countries and even frontier countries for our more risk adverse investors. The United States boasts the world’s largest economy and stock market, the country’s importance and share of the world economy has been declining, particularly as emerging markets have grown in size. Remember, investing solely in US stocks means excluding nearly three-fourths of the global economy and over half of the world’s stock market value. Investors can potentially reduce portfolio risk by diversifying their investments across various asset classes–categories of investments–each tending to respond differently to various market cycles and events. International stocks are one of the five main asset classes, along with large-cap stocks, small-cap stocks, bonds and cash investments. While international investing has higher stand-alone risk, the power of diversification across asset classes can potentially lower your overall portfolio risk. Put simply, by investing abroad you gain exposure to companies operating in other countries – with potentially unique products and customer sets, which ñ may weather market downturns and upturns differently. 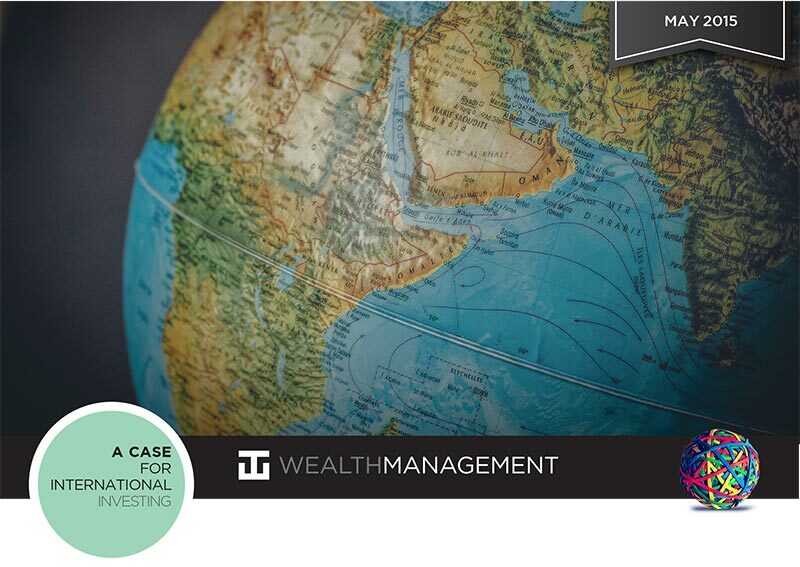 One of the major benefits of investing internationally is the improved diversification of your portfolio. More than half of the investment opportunities in stocks around the world are available outside of the United States. Seventy percent of the largest automobile companies, 70% of the diverse telecommunications companies, 80% of mining and metal companies, and 60% of the largest electronics companies all exist outside of the U.S., making up a huge portion of the big companies around the world. This means that for anyone who wants to invest in any of these businesses, they must invest outside of the country. 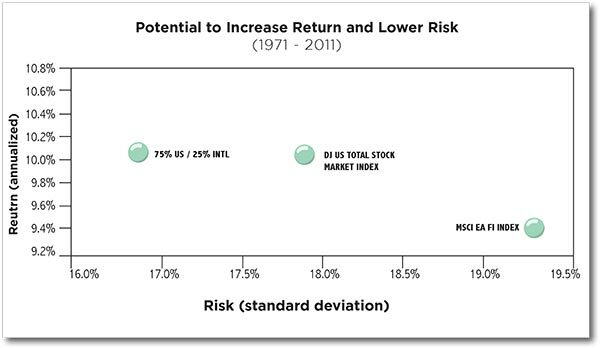 Investing internationally brings increased risks and volatility. However, the good news is that many of these risks are reduced if you hold a diversified (by country, sector and company) portfolio of international stocks, such as many ETFs provide. One the ETFs we use at WT Wealth Management has over 1,300 holdings with exposure to 24 countries. The short term is what everyone focuses on, for better or for worse. So, when weíre talking with our clients, what we try to encourage is to take a step back and think about their long-term investment objectives. The objective of being globally diversified, whether itís in fixed income or equities, is to be more diversified rather than less diversified. If we are trying to react on a minute-by-minute or day-to-day basis, weíre going to end up chasing our own tails. Admittedly, it’s been a struggle over the last several year staying committed to an international allocation. The U.S. has performed well and developed and emerging international markets have lagged far behind, but as they say “the worm always turns”, it’s just a matter of when. Global diversification doesn’t come without risks. Only your financial professional can determine if the rewards outweigh the risks. Here are some of the most common and well known risks associated with international investing. Political and regulatory risk: Foreign governments can be less stable and they can have restrictions on how freely businesses operate as well as their ability to earn profits. Also, a country’s financial condition can undercut growth prospects. Information risk: Finding timely and accurate information about international investments may be more difficult, and there can be differences in accounting standards. This can make comparisons to US companies challenging. Currency risk: There’s the possibility that the currency of your investment will fall relative to the US dollar, lowering the return after it’s translated back into dollars. Transaction risk: Some countries impose currency controls that restrict or delay currency conversion, prolonging the time until you are able to access your funds. Reporting, clearing and settlement of trades also may take longer. Higher volatility of returns: International markets can be more volatile and trading can be less liquid (fewer shares changing hands). Dollar-cost averaging–investing a fixed dollar amount at regular intervals–can be a good tactic to spread out risk and lower the average cost per share. Higher costs: Investing directly on foreign exchanges can bring additional fees, including higher commission costs, exchange fees, stamp duties, transaction levies and foreign currency fees. These fees are the reason most international mutual funds and ETFs cost investors a bit more (via higher expense ratios) than their domestic counterparts. At WT Wealth Management we advocate a globally diversified portfolio for most investors. Since the great recession of 2008-2009 investors have become more concentrated in their domestic allocations for a few reasons in our opinion. The last few years have produced better returns in the U.S. than abroad and the associated higher degree safety that investing in the U.S. brings, while adding some comfort to already jittery investors. In 2014, the S&P 500 returned 13.69% while the developed international benchmark the EAFE lost nearly 5%. In 2013, the S&P 500 increased 32.3% while the EAFE gained 22.8%. In fact, the EAFE has only beaten the S&P 500 twice in the last 5 years. However, as of May 1st, 2015 the S & P 500 is up 2.4% while EAFE Developed Market Index is ahead 10.54% and the Emerging Markets Index is better by 9.85%. Will this continue? Who knows, but it illustrates the benefits of fully diversified global portfolio, having a plan and being patient. At WT Wealth Management we have an active approach to portfolio management and actively transition our clients’ investments in an effort to seek out opportunities around the world. While we hated the exposure our clients had in foreign investments last year, we are loving them this year.